I won this book from the publisher Serpentstail. It is also on the longlist for The Man Booker Prize. 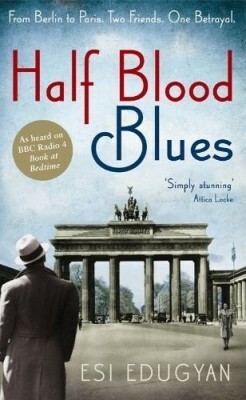 Can’t say that Half Blood Blues was really what I expected. I expected it to primarily be about the second world war and what it was like to be a black person living in a Nazi occupied country. The book of course did have an element of this in, and the setting of the war was important for the story, but really it was a book about a group of friends, and about music. At first I found the voice of Sid (the narrator) really annoying but as I got used to it, and started getting into the story, it ceased to be a factor that really mattered to me. I did come to enjoy the book, mainly because I wanted to know what Sid did, but once I knew I was still interested in continuing to read. I can’t say I really connected with the characters. I wanted everything to turn out right for Sid but only because I felt sorry for him. I found the ending was a little abrupt too, especially as they rest of the novel looked to that pont, I just felt it could be expanded upon. Would I recommend it? Yes I suppose so but I don’t think it’s really award winning material, just a decent read. I can’t think of a book about music that I’ve enjoyed and I’m tired of books about WWII. I can’t see myself enjoying this one, but I’ll give it a try and hope to be proved wrong. Sorry to hear that you didn’t enjoy it. Better luck with your next one. I quite like WW2 books but hey can get a bit samey. The only music one I’m every liked is An Equal Music- Vikram Seth. Hope you do like this one all the same.